Often, when we talk about climate change, it seems like a far-off scenario. We talk in terms of saving the planet for future generations and predict disruptive sea level rise within the century. But the effects of climate change are already felt around the world; future changes will only intensify them. On May 20, 2016, the first major fire in California began, sweeping across 3,700 acres in San Luis Obispo county. It was contained before harming anyone or damaging any buildings, but it signified the start of the state’s wildfire season. Before the year’s end, 6,938 fires would consume 565,070 acres in the Golden State alone. Last year wasn’t as bad as 2015, at least, which holds the dubious distinction of the worst wildfire season in U.S. history. But the long, dry fire seasons plaguing western states every year are only getting worse. From 1980-89, there were about 140 major forest fires every year; that number has shot up to about 250; in the West, wildfires have more than tripled since the 1970s. Furthermore, forest fires have doubled in size in the last three decades. WIldfires are one highly visible sign of our warming planet. Climate change is, of course, not the only factor influencing the rise of fires; weather patterns like El Nino can affect precipitation, which is a major part of the fires, as well. And land use—such as agriculture and urban development—also plays a role. Yet many of fires take place in national parks and protected areas, so it’s clear there are factors beyond land use to consider. So what, exactly, has changed so much? Part of the reason is a lengthening dry season. Temperatures are rising and precipitation patterns are changing. In a more dynamic climate, wet areas become wetter and dry areas become drier. The snowpack melts up to four weeks sooner; in fact, in many states, milder winters mean more rain and less snowfall, so the snowpack itself is much smaller. Spring arrives earlier now than it did a few decades ago and fall lingers longer. Instead of a five-month fire season, many places are now at risk for seven months or even longer; some regions may even see a year-round wildfire season. With a longer dry season, soil and plants in wildfire-prone zones have plenty of time to dry out and become fuel for fires. And while rain and snow have traditionally helped tamp potential fires down, research shows that fires will be affected more and more by temperature, rather than precipitation. Fires are also spreading to places previously not at risk. As more regions experience drought and water issues due to a changing climate, they may become vulnerable to wildfires. In addition to the United States, increased risks of fires will hit South America, central Asia, southern Europe, southern Africa, and Australia—caused mainly by warmer, drier conditions. That is, unfortunately, not all. These warmer, drier conditions form a haven for beetles and other insects. The bugs, which reproduce more rapidly in warmer conditions and survive shortened winters more easily, feast on trees, whose defenses do not endure these changed conditions nearly as well. When the trees die, they become highly combustible fodder. While many fires are begun by humans—throwing a cigarette out the window or abandoning a campfire—others are begun by thunderstorms. The National Wildlife Federation estimates that a 1.8 degree Fahrenheit temperature increase could lead to a 6 percent increase in lightning. “This means that lightning in the region could increase by 12 to 30 percent by mid-century,” the organization reports. If, with luck, rains do come, they often result in flash floods that sweep through the dried-out soil and open areas of fire-ravaged regions—removing nutrients that could be cycled back into the ecosystem and posing other serious safety concerns to those living nearby. Expenses from fire damages are also soaring. Wildfires damaged properties to the tune of $665 million per year between 2000 and 2009. Those who own property near forests and grasslands—more than 5 million in California alone—will face >more risks to their homes as wildfires increase in number and intensity. That’s with state and federal governments ramping up the money they spend to contain the fires. The U.S. Forest Service reports its annual firefighting costs have exceeded $1 billion dollars at least twice since 2000. The amount they spend suppressing fires has risen from 16 percent to more than 50 percent of their budget. Wildfires also cost us our health—first, by “directly threatening the lives of people in their paths, and less directly by contributing to local air pollution and worsening respiratory health. Forests and grasslands become more susceptible to fire because of climate change, and those fires in turn exacerbate climate change. Fires increase emissions, decrease biodiversity, and create fewer green spaces to capture carbon dioxide. Without as many trees to absorb the carbon, more has escapes into the atmosphere—making temperatures rise and weather patterns change. It’s an escalating relationship that plays on loop. The boreal forests of Canada, Alaska, Scandinavia and Siberia are at particular risk—and play an outsized role in contributing further to climate change. This arctic region stores about 30 percent of the planet’s carbon in its trees and permafrost (permanently frozen land). But, as National Geographic reports, “Climate change is playing out twice as fast in the boreal forest than it is on the rest of the planet.” The ground begins melting, the health of trees begins to deteriorate, and the forests become much more susceptible to wildfire. Fires like the Fort McMurray blaze in Canada last year can release all of that stored carbon into the atmosphere—and create vastly different conditions in the boreal forests, leading to more fires in the future. While it’s difficult to reverse the effects of climate change already being felt in wildfire-prone areas, we can address future changes by supporting high-level international action like the Paris Agreement. Creating buffer zones between forests and homes—and designing fire-resistant neighborhoods and houses—also helps keep people out of harm’s way. On a more individual level, you can be careful about lighting fires in dry areas, especially those at risk of fire. 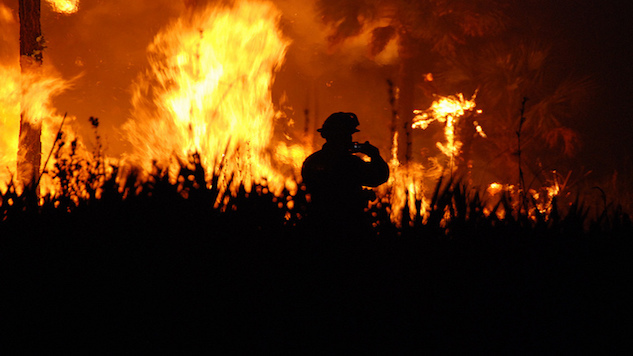 Up to 90 percent of wildfires in the United States are caused by people. It turns out, Smokey was right; practicing a little fire safety goes a long way. Maybe next he can remind us about climate safety. Melody Schreiber is a freelance journalist based in Washington, D.C.